The in-season is a tough battlefield for hockey players. 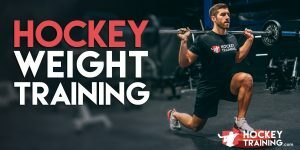 You’re expected to show up at every practice, every game, every strength training workout, and every conditioning workout all the while staying on track with your eating and training. Whether you’re beat up from last night’s game or not. Many of you reading this may still be in school and those of you who aren’t have jobs to attend to. Those of you whose job is playing hockey have a travelling schedule which makes hockey your full-time job. All of these combined time consuming and demanding factors make it pretty tough to be on point with your nutrition at all times during the year. Not impossible, the super dedicated will always find a way. But tough nevertheless. Exam schedules, busy seasons at work, travelling, moving, getting married; life can throw all sorts of things at us that get in the way of doing the things we love to do. More often than not nutrition is the first thing to hit the back burner. Sometimes you just simply have to make the best of the situation you’re being dealt. This usually means foods that are easy to pack or convenient to buy in any city while still staying on track. Let’s first make something clear, the road is not the place for optimization. If you’re travelling or eating out on a regular basis your goal is to simply manage what you can so you don’t regress in physical development or performance. Really? What is it you do for a living? Is your body not a machine for performance? Then you have to fuel the machine my friend! All this nutrition stuff will 100% have a positive impact on your performance and can also increase the amount of years you get out of this career. If performance and longevity are on your radar, which they definitely should be, then you have to do your best with what you have got. You can compare an athlete’s body to a high performance race car. When it’s time for the best drivers in the world to race they don’t just pull the formula 1 race car out of the garage, blow the dust off of it and bring it to the start line. They fine tune that machine year round as much as humanly possible so that come race day it performs at optimal levels. Exact same thing goes for you guys. Your recovery, training, nutrition, sleep and stress should always be managed so that when game day comes you can put forth your greatest performance. An important note to make here is that effort doesn’t always equal performance, it equals effort. You might feel like you’re putting out a high amount of effort, but that doesn’t say a damn thing about how well you’re actually performing. Keeping all these things in line is what is going to bring your performance up to your level of effort. Remember that. With all that in mind, doing the best you can on the road with your nutrition can play an important role managing some of these outcomes. Here are my top 3 rules of success to stick to if it’s not at all possible to pack and bring your own food. You would think that this would sound somewhat obvious but it’s not in all cases. There are many athletes who are very diligent with their daily nutrition and then get caught off guard when going out of town and don’t have time to get all of their stuff together. They’ll wake up the next morning in the hotel and the continental breakfast is a table with breakfast cereals, muffins, bagels and waffles. But you know what? Eating something is always better than eating nothing. 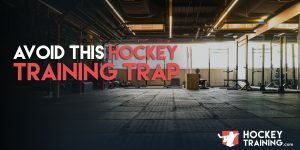 If you’re totally backed into a corner in a scenario like this for whatever reason, eating some cereal and milk will lead to greater performance than going to the rink on an empty stomach. Just get it in you and plan better next time. The idea that you have to eat every 2 hours to “keep the metabolism high” has long been debunked by research and holds no meaning in today’s nutritional science discussions. Your metabolic rate reacts and responds to many different aspects including your current state of physiology and the choices you make with your diet, timing is irrelevant from a metabolic rate perspective. But, one thing that is wise for athletes to be concerned with is amino acid availability throughout the day. For many different reasons including muscle repair, tendon repair, general health and performance keeping a “round the clock” availability of dietary amino acids is a very good idea for hockey athletes. It turns out the long recommended 1g/pound of bodyweight idea is quite a sound recommendation and is highly backed up by research at this point. It’s important to note that even this recommendation is playing it quite safe for athletes. There is no need for athletes to be going over this mark. Sometimes you will hear or read of athletes playing with 1.5g and even 2g/pound of bodyweight. This is just flat out unnecessary and takes away from other things in the diet that could be boosting performance for effectively, such as carbohydrates. After the cells of the body are filled with stored protein, any additional amino acids can be degraded and used for energy or stored as fat or glycogen. In other words, once you have hit your required/recommended intake there is no further benefit to going above and beyond what’s ideal. It will act like any other macro-nutrient and be subject to energy use or to be stored as glycogen or fat. The conversion of amino acids into glucose or glycogen is called gluconeogenesis. 18 to 20 amino acids have structures that allow them to be converted to glucose and 19 of the 20 amino acids can be converted to fatty acids. From an energy production perspective, the body almost entirely uses carbohydrates and fats for energy. But for the people out there increasing protein intake well beyond levels required to support bodily functions + gains in lean muscle mass, additional protein will not do you any good. And could also in fact be detrimental due to the fact that if you’re eating more protein, odds are you are eating less carbohydrates. Why use protein as an additional energy source for training when carbs do a way better job? Especially if this net increase in protein isn’t contributing to greater lean muscle mass gain? Ideal habitual protein intake should be around 1g per pound of body weight per day. Use your calorie allotment wisely when setting up your macro nutrient periodization. You want to fuel training as much as possible while still allowing maximal lean growth. This goes for both fat loss and muscle building goals. So if you’re a 200lbs athlete, you should be aiming for 200g protein daily. Being that the average chicken breast is going to have around 36-42g of protein and a single scoop of protein usually nets 25-30g protein this should not be any problem. Since protein is an incredibly important macronutrient and its daily recommendation for athletes is so easy to remember this should be a real target for you when travelling. So long as you’re hitting your daily protein intake, you’re doing yourself and your performance a lot of favors. How do we get this in? Well first and foremost it’s important to note that not all fast food is equal. Lots of people just throw all fast food into one category and say that it’s all garbage. Compared to making your own meals, yeah, it falls below the mark. But when you’re out of the house and you have no other options – wraps, burritos, supplements and subs are your friends. Yes, burritos! So long as you’re not an idiot about it they can be a great on the road meal. If you order a burrito ask for double meat and load that thing up with vegetables and avocado. Lots of protein, vegetables, a manageable amount of carbs and tons of fiber. Sounds better than a cheeseburger to me. Moving on to subs and wraps, same deal here. Throw double meat on that thing, load it up with vegetables and you’re good to go. Keep in mind with both the subs and the burritos, go easy on the sauces. Staying away from the heavy sauces/condiments (mayo, ketchup, etc) is ideal. Lastly, I do like supplements in this “on the road” department. Supplements have a known amount of nutrients and calories which makes tracking your intake extremely easy. They are super convenient to both eat anywhere and travel with you anywhere. Protein bars (natural ones), protein powders, RTD drinks are all your friends on the road. Restaurant quality steak, salmon or chicken. If you have the opportunity to sit down at a decent restaurant and order a meal, do that instead of going with the above options. If you’re out at a tournament and you just finished a game, hit up the steak/potato/vegetables and go easy on all the condiment stuff (I shouldn’t have to mention don’t order alcohol, but I think I do). But if you didn’t just play a game and you’re just out, order the steak plus a double order of vegetables. Simply ask to replace the starch with a second serving of vegetables. I do this everywhere I go and have never had any issues at all. If they charge you a little more, that’s ok, consider it your 6-pack tax. Above are several options which give you no excuse to not get at least something in you every 3-4hrs. Proteins digest at varying rates (For example: 6.1g per hour for casein vs. 10g+ per hour for whey) so if you know it’s going to be a very long time before you can eat again, keeping some casein around or having a high fat/high protein meal (fat slows the digestion of protein) before you go is wise. 6. A 6% loss in body water: Physical exhaustion, heatstroke, coma. As seen from the above, water is not something to be taken lightly and is a component of your everyday routine that has a serious ability to make or break you. On the road is unfortunately where most athletes drop the ball on this one which is why drinking water alone makes itself into my top 3 success tips. At home it’s very easy to have access to a tap and just drink up when needed. Whereas on the road or on a plane most people don’t drink near as much water as the usually do and without understanding the implications it can simply be waved off as not important. Ideally, your pee should be clear or slightly yellow throughout the whole day. If you’re peeing 5x throughout the day and 2x after a workout, you’re doing well. What you don’t want is only a few urinations per day that appear very yellow and concentrated. There are many water intake guidelines out there, my personal favorite is Body weight / 2 = daily intake in ounces. Example: 200lbs / 2 = 100oz daily water intake (this shouldn’t include exercise as different people sweat at different rates, this is simply a daily guide). When everything gets taken into consideration and you can only do three things while you’re gone or while you’re super busy, this would be my answer for you. I hope I shed some light on how important “on the road” nutrition is and brought forth some easy, readily applicable strategies for you guys to use and incorporate for your next outing. 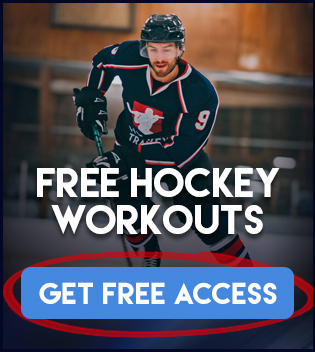 Our In-Season Hockey Training Program will be available at our Hockey Training Programs page. Make sure you get signed up so this year can be your best year ever on the ice!